About a year and a half ago, I was searching the net and accidentally came across a crazy cool idea. 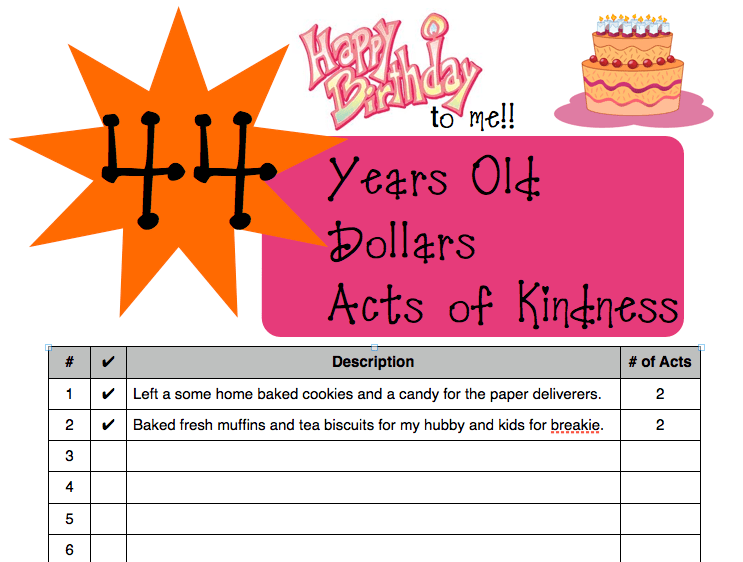 This lady had decided to perform “random acts of kindness” on her birthday, with the number of acts equalling her age. What a clever idea I thought! At this point my 44th birthday was still 6 months away, but I immediately began to contemplate the possibility of pulling this off. When I looked at the calendar, I realized that May 24th, 2012 just happened to land on my day off from work. At that point, I knew that I was going to make every effort to pull this off. Sometimes the best thing you can do for our own emotional health and well-being is simply to “check-out” for a day, and just try to not think about yourself at all. Although this blurb below was not directly my inspiration, you can see how little things can make a difference to someone’s day. Just that fact that someone notices them or takes the time for them, carries a message of “you are special and people do care”. Shay enjoying the fresh baking! Before going to bed on the 23rd, I would set in motion my quest, by leaving out little packs of cookies for the two people who deliver our newspapers. They come very early and I knew I would miss them if I didn’t leave their little blessings out the night before. My second act would begin at 5:30 a.m. when I got up to bake fresh muffins and tea biscuits for my family and delivery later in the day. While the goodies were baking, I wrote my husband a love letter. How fun!! I also cellophane wrapped many of the cookies and muffins (as they cooled) and attached little notes before I left. I did up a few plates of baking and took some loose in a Tupperware container to hand-out along the way. By 7:30 a.m., the water was on ice and the car was loaded. I had pre-established my route so that I could make all of my deliveries and not have to do any back tracking. I had calculated the approximate timing and had a list of people who I wanted to bless along the way. I had invited my children to join me for the afternoon and thus needed to be back home by lunch time. They were thrilled to “play hooky” (this never happens at our house), but I figured the life experience of being a giver without any expectation of thanks or even gratitude would be as valuable as any lesson at school that afternoon. I grabbed a clip board and my recording sheet to help me keep track of all of the “acts of kindness” completed. I set-up the sheet to show how many people may have been impacted by the one act (last column), as I only counted each item a single act even though it may have been received by many. A good example is plugging the vending machines with money. I counted it as one act, but because I left money in many, it may have actually been a blessing to several people. It was really important to keep a record of everything or it would be impossible to stay on track and know where I was at in my quest. I did most of the preparation myself and spent the morning doing tasks that were further from home and involved people from my work or friends through work. I picked my kids up at lunch and they joined me for the afternoon. 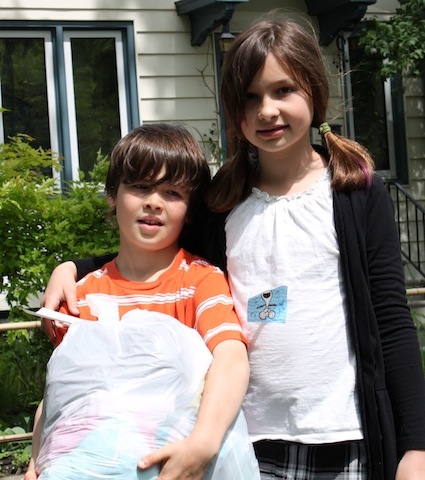 Eden and Shay helping to delivery clothes. 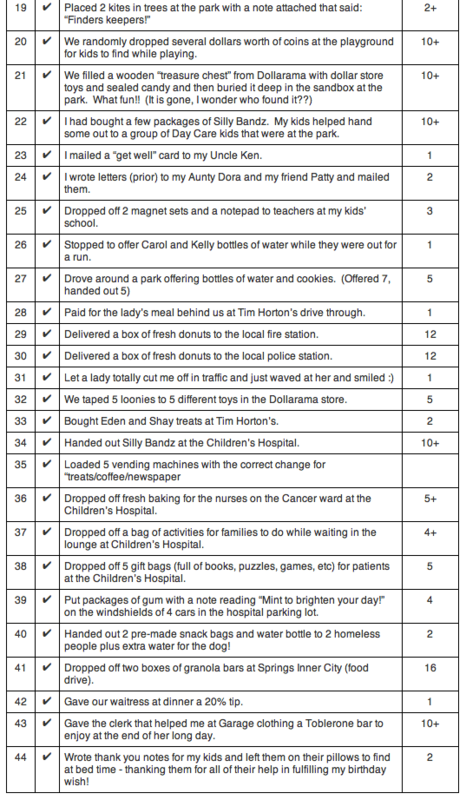 Please note a few typos, #21 and #43 should only count as “1” act of kindness not 10+. Oops! I literally finished my last act around 9 pm, totally exhausted, but thrilled with the success of the day. You can see that many of the acts only counted as one on my list of 44, but may have impacted as many as 10 people. 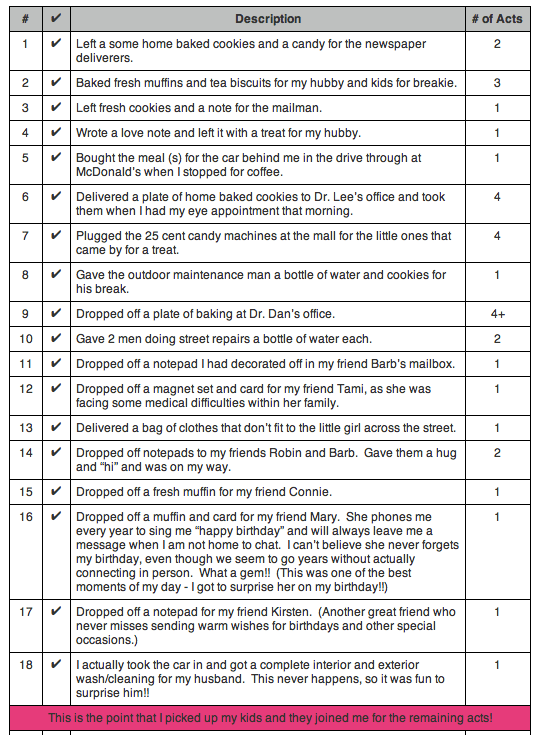 44 Random Acts of Kindness ~ Who is More Blessed, the Giver or the Receiver? There were several really memorable moments from the day…..like surprising Mary with the muffin and note BEFORE she had a chance to phone and sing me “Happy Birthday!” or the city worker in the park that was sweating as he worked and got choked-up with our small offer of cookies and water. It was a proud moment when my 8 year old son shared his revelation that “it really does feel good to do nice things for others!” (He said he thought grown-ups were trying to trick him when they said that it feels good to do things for other people – he finally truly understood the message from the “Bucket Book” – yay!!). It was amazing to watch my kids as they became totally absorbed in how they could make others feel good by simple, small random acts of kindness. Towards the end of the day, I observed how their behaviour became so much more considerate – with emphasis on good manners, opening/holding the door for others, more observant and in tune with those in need. It made me just want to freeze that moment in time. It was an unbelievable experience with not even a moment to think of yourself. The quest had me totally consumed with the welfare and happiness of others! Such an incredible experience, on so many levels. I basically accomplished my quest, but blew my $44 budget. I think that you could easily do it for that amount, but I got carried away with the gifts, etc. If you were to count every single act of kindness, it would be easy to stay within a tight budget. For example, instead of 4 packs of gum, do one. It definitely was a Happy birthday to me!! By far the most memorable in my now, 45 years! I know it will be hard to ever top that. If you liked this post, please leave a comment below. I would love to hear from you! Posted on July 15, 2013 by Cindy Roy •	This entry was posted in Health and Wellness and tagged acts of kindness, be a blessing, birthday quest, blessed to be a blessing, pay it forward, random acts of kindness. Bookmark the permalink. Cindy, I could barely read through to the end . . . I was literally weeping! You are soooooo your Mom’s daughter; I kept thinking of how proud she would be to read this. God Bless you. You are an inspiration. This is the best idea. Imagine if everyone did this?